When it comes to skincare and makeup, although I do use a lot of different brands from different continents, I’m quite partial to trying out Asian brands still. At the end of the day, they’re made for Asian skin so they address specific issues and needs that are unique to us Asians. Fortunately, we now have Bright Skin–a company that distributes and carries high end and independent skincare brands from all over Asia, so we no longer have to look far to get our hands on the best Asian products. In fact, I just got to try 3 of their products for review. 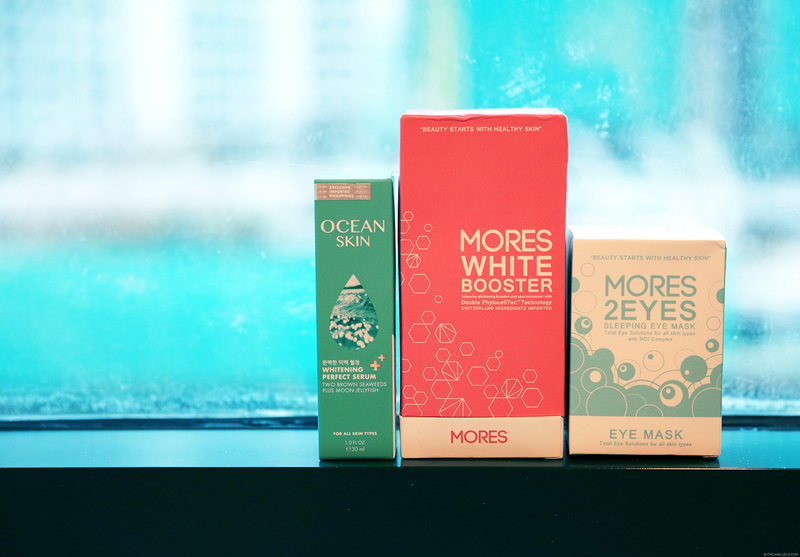 Introducing Ocean Skin Whitening Product Serum, Mores White Booster Plus and Mores 2Eyes. Let’s start off with Ocean Skin Whitening Perfect Serum. Made in Korea and developed in Thailand, it’s main goal is to keep skin pure, glowing and translucent like Korean women, which is why it’s tagged as “the secret to translucent skin”. It is entirely produced from 100% deep sea natural resources which contain plenty of minerals and untainted components. Some of these resources are moon jellyfish extract for skin tightening, anti-aging and moisturizing; and two types of brown seaweed extract for lightening dark spots and reducing wrinkles. When I found out about these ingredients, I felt so weirded out at first because they’re not the usual ingredients you see in skincare products. But hey, they’re natural anyway so might as well give Ocean Skin a try. So here goes! Unlike other serums, Ocean Skin is lightweight so it doesn’t feel sticky or thick. I’ve been using it twice a day for some time now after cleansing my face and every time I apply it, I feel like my skin gets more dewy, soft, tight and plump. In a nutshell, my skin looks glowing and really young (not that I have old-looking skin anyway but you get the picture). You can actually feel and see the difference right away. After applying Ocean Skin, I follow it up with Mores White Booster Plus, upon the recommendation of Bright Skin because apparently they work well together. I don’t use this product twice a day though, only once daily and a few times at night during the week, just when I feel like my skin needs a little more “boosting”. It more or less has the same benefits as Ocean Skin with just a few more “bonuses”. It’s anti-bacterial so it helps get rid of pimples. It has skin-whitening concentrate which removes dark spots & discoloration. It contains 2 Queen Plant Stemcells–Phytocell Alp Rose that smoothens, protects and strengthens skin barrier; and Phytocell Argan Spinosa that repairs damaged skin and improves skin density and tightness. Although Mores White Booster Plus is from Thailand, it contains botanical extracts and ingredients sourced from Switzerland. I guess this is why even though it promises a lot of benefits, it doesn’t feel heavy at all. Out of all of the products here, this is actually my favorite. I really saw improvements on my skin especially when it came to dark spots and skin dullness. I felt that my skin is healthier! Another product I tried from Mores Skincare is Mores 2Eyes, which is the latest innovation from the brand. With imported ingredients sourced from France, it promises to boost collagen and elastin, reduce dark circles, eye wrinkles, eye bags and varicose veins. Oooh lala, this sounds like heaven! You see, I’m always on the lookout for eye care products especially because of all the late nights I spend so it’s no surprise that I was most excited about trying this product out. Unlike other eye treatments though, Mores 2eyes is only to be applied 2-3 times per week. So far, I haven’t seen major changes to my eye bags but it definitely brightened up my eyes. It works wonders on reducing dark circles and fine lines! Maybe my bags need a bit more time. They’re designer (eye)bags after all. LOL. So there you have it! Another review of beauty products you can add to your daily routine. You know what they say (or is it just me who says this), a girl can never have to many skincare products. You’ve got to take care of your skin! Visit BrightSkinPh on Facebook and @BrightSkin on Instagram for more information and Asian beauty products. Hi, Ms. Camille! Been your fan since lookbook launched. Anyway, is it all right to use Olay moisturizer and then BB/CC cream after I apply Ocean Skin on my face? Or will Ocean Skin and then BB/CC cream suffice? I’m sort of worried using a variety of products at the same time as I fear I might have breakouts. Thank you so much! It looks so nice! but I really have a sensitive skin so I’m not sure if I can use it? Good thing about it is that it’s more natural but make sure to test it on your neck first :) If no reaction, then go for it!